Last night I watched the first episode of The History Channel’s Barbarians Rising. The episode dealt with Hannibal’s invasion of Italy and it was not good. It started with a definition of barbarian (“anyone who was not Greek or Roman”) that would have embarrassed the most imperialist 19th Century historians, but it was actually when it staggered haplessly into an attempt to make links with contemporary concerns that it really fell to pieces. The decision to try and make a link between Carthage’s war on Rome and the American Civil Rights struggle (Jesse Jackson and Clarence B Jones appear as talking heads) was misguided and badly handled. The lowest point comes when Jones said “it was the barbarians who opposed slavery, they were the first freedom fighters”. This is utter nonsense. Everyone from Herodotus to Appian attests to the fact that Carthage kept slaves. The Romans had a law to block Carthaginians from selling slaves in Roman territory from lands with which Rome had treaties (The Slave Systems of Antiquity, Westerman, 1955: p58). Appian describes how, on invading North Africa in 204 to (finally) draw the Carthaginian army out of Italy after 16 years of attritional war, Scipio freed Romans and Italians taken as slaves by Hannibal. We know that Carthage took slaves in other conflicts and can assume its wars (against the Greeks in Sardinia and Sicily, with the peoples of Libya and Numidia and its conquest of Spain, by Hannibal’s father) must also have created many slaves. Hoyos (The Carthaginians, 2010: p71) notes Hanno, rebelling against Carthage in the 340s BC, was able to arm 20,000 slaves to support his uprising. He also notes that the general defending Carthage from Scipio’s siege was able to buy 5000 slaves to serve as oarsmen in the navy and that, given the urgent need, “most of them must have been bought within North Africa”. Carthage was at least as reliant on slavery as Rome or Greece. And, probably like Rome and Greece, the colour of a person’s skin or their “nationality” had little or no bearing on their status. It’s not that there’s a problem with the idea of Barbarians Rising. I have a fascination with ancient Greece, but even I can see focus on Carthage (and other non-European civilisations) is a useful corrective to the cultural myopia of traditional “classics” and a means to achieving a proper understanding of the world in which all these cultures developed. But the attempt by Barbarians Rising to link one historical struggle between people of African descent and people of European descent (Carthage versus Rome) to the specific experiences of Africans in the era of European slavery is fundamentally wrong. It is, in my view, an example of crude cultural imperialism – of imposing a powerful culture’s assumptions and expectations on the history of a different people (even if those people lived over 2000 years ago). It is especially wrong when you resort to just making stuff up – there is no sense in which Hannibal’s war on Rome was a fight against slavery – or when you have to gloss over awkward facts – such as that Hannibal might not have been particularly African. 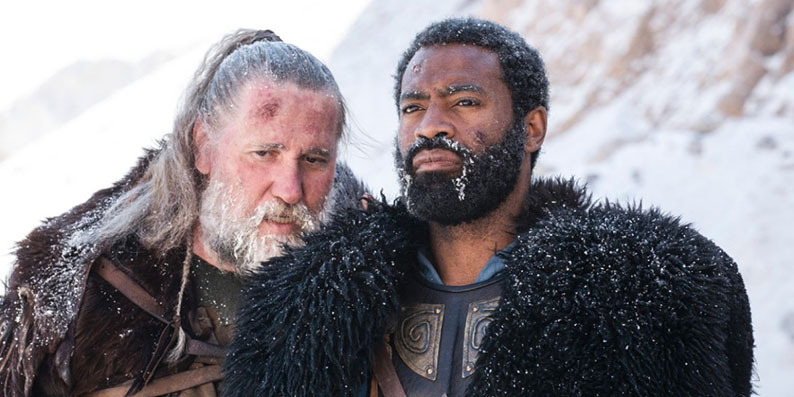 Barbarians Rising chooses to portray Hannibal with the actor Nicholas Pinnock – a man of Afro-Caribbean descent. That’s not a problem, he’s a good actor (actually the acting of the dramatized parts is by far the strongest part of this drama-documentary) but Hannibal was part of the aristocracy of Carthage – a Phoenician colony and a rigid oligarchy dominated by a handful of ancient families. There’s at least a possibility that, far from looking like the descendant of someone from west or central Africa, Hannibal Barca could have looked like someone from The Levant. This not even mentioned, presumably because it would get in the way of the spurious link the programme tries to make between ancient attitudes to slavery and race and the way they are understood in modern America. The co-opting of Hannibal as a “black hero” to counter the many dead, white, men who make up most of ancient history’s canon is understandable but the use of him in this programme is simplistic to the point of distortion. There’s a weird contradiction: an attempt to introduce greater diversity into our understanding of history (by focusing on the peoples normally described only in their opposition to the Romans) actually achieves exactly the opposite, imposing a specific and particular 21st Century American mindset on the actions of figures from ancient history. This is dangerous because it imagines that the things that divide us today have, somehow, been immutably passed down through history and that they are, thus, eternal. This is a mistake. Even if we assume that Hannibal was a black African (as he might have been), his struggle against Rome wasn’t any more a struggle of race against race, or emancipationist against slaver, than was the fight between Rome and the Greeks, led by the city of Corinth, who were defeated destroyed by Rome in 146BC – the same year as the salting of Carthage’s earth. Modern ideas of race are much shallower and much less permanent than Barbarians Rising allows. Views of race were different in the past and they will be different in the future. We don’t know exactly how the peoples of Hannibal’s era thought about race and skin colour – there must have been prejudices – but we can be sure that their views were not ours. This certainty exists because nowhere in the surviving, often virulently pro-Roman, accounts of this conflict do we find any expression of the kind of methodical racism that exists in the annals of recent imperial powers such as, for example, in the histories of the British empire. There are loads of interesting things to say about Carthage and Hannibal and their fight against Rome – but painting them as standard bearers for ancient freedoms against European slavers is a mistake. Trying to present every interaction of African and European through the template of the American experience of slavery after the 16th Century distorts history and represents the overwriting of one set of experiences in the desire to impose our own beliefs. This entry was posted in Blogging and tagged ancient history, Barbarians Rising, Roman history, Rome, slaves. Bookmark the permalink.